Into the Woods › What's a wellhouse, and what's a pumphouse? What's a wellhouse, and what's a pumphouse? 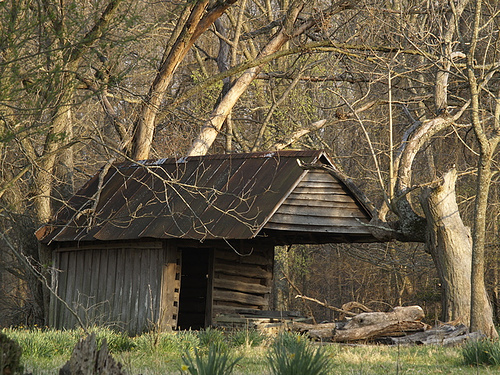 A typical North Carolina wellhouse. In this abandoned wellhouse, the well is gone, but it would have been under the porch. Inside are the milk troughs and places for food storage. In a comment here, a friend asks what’s the difference between a pumphouse and a wellhouse. The pumphouse is a small building to house (and keep from freezing) the parts of the water system that aren’t in the well. That includes the pressure tank and the pressure control switch. It’s a necessary part of the water system. A wellhouse was a common outbuilding in the days before electricity. The well itself, with a windlass and bucket for drawing water, generally was near the wellhouse door. Inside were water troughs in which the milk jars were stored and into which cool water was poured a couple of times a day to keep the milk cool. I have no real need for a wellhouse on my place, but I do need an outbuilding. I decided that an outbuilding in the style of a wellhouse would not only be practical (not least because wellhouses always have a porch) but also would work well with the style of the house. For rural people who had neither electricity nor ice, the wellhouse was the refrigerator as well as the source of water. It was always built in the coolest and most shady spot available. My grandmother’s wellhouse was overhung with a willow tree. I may do the same thing, for the sake of tradition. This was written by daltoni. Posted on Thursday, March 20, 2008, at 6:36 am. Filed under The house, The land. Bookmark the permalink. Follow comments here with the RSS feed. Post a comment or leave a trackback. My grand folks used an Ice box after they moved away from the well house concept. I recall the “iceman” driving up in his giant truck scurrying to the back and grabbing a huge block of ice laying it on his shoulder (he wore a canvas or rubber pad on his shoulder to protect him from the sharp edges and bruising) carrying it to my granddad waiting on the porch. My granddad would chip a few pieces off for us kids… it was fun in those days. I always wondered later what happened to the icehouse where the ice was made. Good luck with the continued settling in.